The best chocolate chip cookie recipe EVER! The secret is in melting the butter (no more waiting for it to soften!). Chocolate chip cookies are little morsels of memories. I’m sure you, too, have more than one memory that has a chocolate chip cookie wrapped up in it. If you’ve been on the hunt for a great recipe for chocolate chip cookies, look no more. This is the last chocolate chip cookie recipe you will ever try. If you don’t love them the first time, make them again; you made a mistake somewhere 🙂 Seriously though, for being a very basic chocolate chip cookie recipe (no extensive chilling time needed, no cornstarch needed, etc.) this is the best recipe out there. 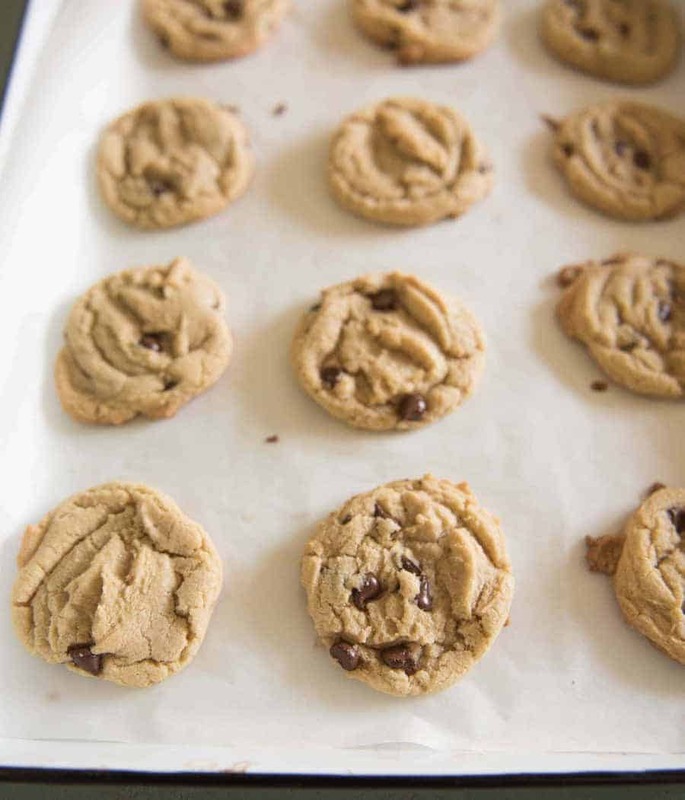 The secret key to this chocolate chip cookie recipe is the melted butter. I LOVE that it uses melted butter because you don’t have to wait for the butter to come to room temperature. When you beat the melted butter and the sugars together you beat and beat until the mixture gets light and fluffy (pictures in the post for reference! ); the process takes several minutes but it’s where the cookie magic happens! The cookies have a caramel undertone that is so delicious and they turn out great every time you make them. They are crisp on the edges, a little soft in the middle, and the perfect cookie texture all around. This recipe is solid, one that I make over and over again and have been making for years. I can’t wait for it to become a family favorite in your house too. It is made with 100% butter – no margarine here. Not only is it all butter, but it’s all melted butter. No waiting for a stick to soften or trying to “soften” via the microwave. The melted butter gives it a yummy almost caramelish undertone. You’ll understand when you get there. 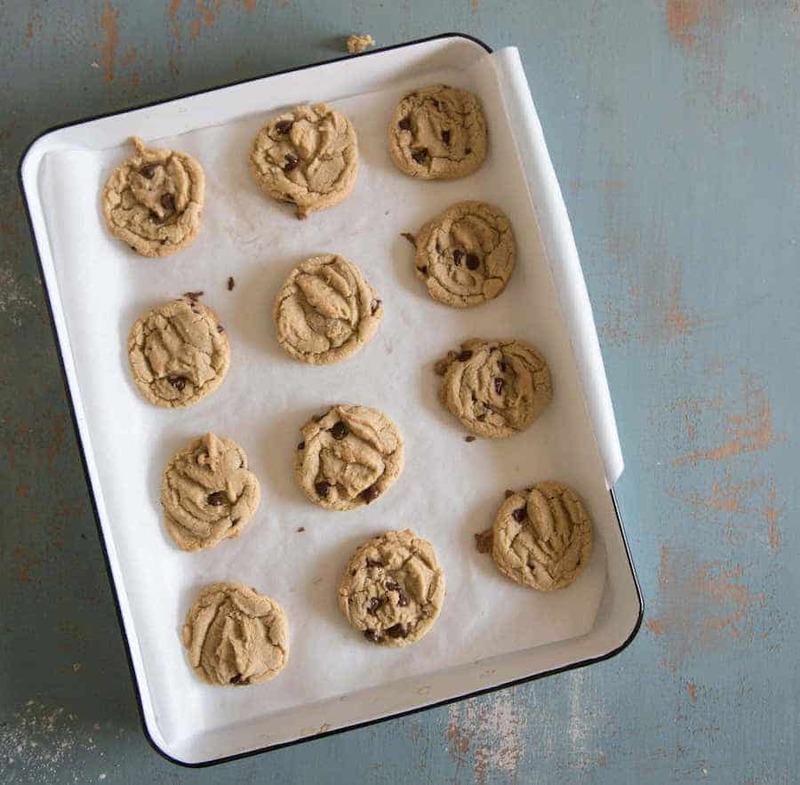 Have you invested in a cookie scoop and baking mats yet? They are game changers and everyone needs both in their kitchen. Chocolate chip cookie dough that you can freeze and bake later?! Yes! I always double this recipe, bake a couple dozen, then form and freeze the rest (form them into the balls, stick them in a single layer in an airtight container, and freeze for up to a month). Just bake the frozen dough for a few minutes longer at 350 degrees (instead of 325). They turn out perfect every time. Now I always have cookies in the freezer ready to pop in the oven on a whim. I haven’t said no to a request for cookies in months! I love having the cookie dough in the freezer, too, for unexpected guests or when I want to take some dinner over to a friend. Hot cookies are always welcome with a meal! Here’s a picture of the butter and sugar mixture. 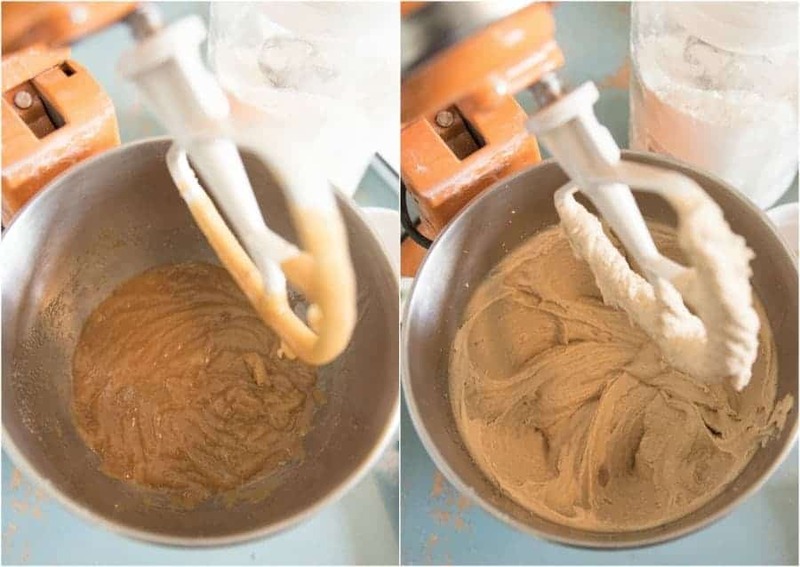 This is what it looks like after about a minute of mixing – dark and caramely (left). Delicious, but not what you are after. We want it “creamed” which means light and fluffy. Here’s what the butter and sugar should look like before you add anything else (right). It will be light and fluffy, and this will take a full 5-8 minutes of mixing. Don’t skip this step! Literally the best chocolate chip cookie recipe ever. The secret is using melted butter! Preheat oven to 325 degrees. In a large bowl, beat the melted butter and sugars together with an electric mixer (or stand mixer) on medium speed until smooth and light and fluffy in color, around 5 minutes. Beat in the egg, yolk, and vanilla until combined. Reduce the speed to low and slowly add half the flour, the salt and baking soda, and then the second half of the flour. Mix in the chips until incorporated. Working with 1 large tablespoons of dough at a time, roll them into balls and place them on a cookie sheet (lined with parchment paper or a baking mat) about 2 inches apart. Bake the cookies until the edges are set and beginning to brown but the middles are still soft and puffy, around 10 minutes. Let the cookies cool on the baking sheet for 5 minutes and then transfer to a wire rack to let cool completely. To freeze this cookie dough, simple form it into balls and stick them in a single layer in a zipper-topped bag or an airtight freezer-safe container and freeze. Place the frozen cookie dough balls on your baking-mat-lined baking sheet and bake at 350 degrees for 10-12 minutes. Hot cookies on demand will change your life! I literally cannot wait for you to make these. 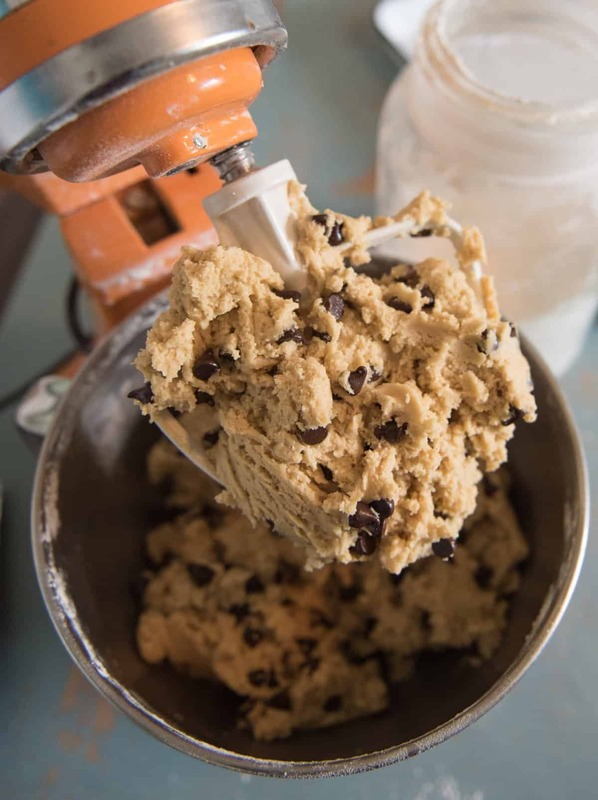 They are going to change your chocolate chip cookie life because I promise you that this truly is the best chocolate chip cookie recipe out there! Did you know I’m a little cookie obsessed? 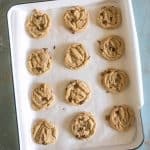 I make this recipe multiple times a month, but I also have whole lot of other cookie recipes hanging around the archives too if you feel like looking around. I personally love the Healthy Applesauce Cookies, and the M&M Oatmeal Cookies. Happy baking friends and enjoy from my kitchen to yours! 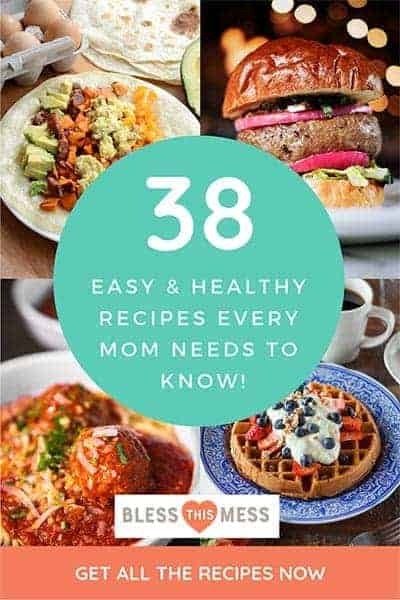 The recipe was originally published in February 2012. It was rephotographed, rewritten, and republished for your enjoyment in June 2017. This is my favorite ccc recipe also….the melted butter and extra brown sugar make them amazing! I’m making these today after church. The only modification that I have to make for the recipe is I have milk chocolate chips, not semi-sweet. Hope they’re still as delicious! yum! though I think rob needs to be the one making cookies @ our house. he made some yesterday that were soo chewy and yummy! So it takes some turn over time between making, photographing, editing, and then posting. SO the cookie posts are all a little old. I’m totally doing what you are doing! I’m doing 6 weeks with no sugar or refined carbs. Must loose my baby weight! I have a treat once a week (normally Sunday) and these are what I want to make all of the time! I’ve only been doing it for a week though so I haven’t made it to my snack day yet 🙂 What’s your eating plan? We should work together. So much better with a friend! OMG! This is probably the only chocolate chip cookie recipe that I will make from now on. Don’t know what does it, but it works! It’s the melted butter I think. It does something magical. Thanks for the kind comment; I love feedback! Do you make these with Whole Wheat Flour? Nope, but if you try you should tell me how it goes! I would totally try whole wheat pastry flour though… that stuff is so good! You are a cookie goddess! I’ve made these several times now, and I love them! Any of your cookie recipes I’ve tried are winners, and I am picky with cookies. Trying when I get home! I love this chocolate chip cookie recipe. I would try it out this weekend and give feedback thereafter. Just made these again last night!!! They are amazing! Just made these following your recipe and they are magnificentttt!! Simply Devine!! 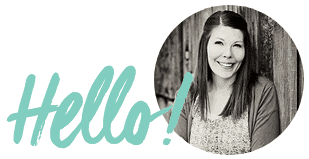 Thank you so much for sharing your recipe and enjoyed browsing your page! These are amazing! I made these for an event I attended today, and they were really well received. I used large chocolate chips and sprinkled some sea salt on top to offset the sweetness. Fabulous recipe, delicious cookies! This has become my go to chocolate chip cookie recipe! They melt in your mouth! ? My husband asks me to make these almost weekly and I don’t ever object. ? I’ve made them for get togethers, to bring to new mamas, and taking them to my new principal tomorrow. Thanks for sharing! Loving hearing that! That is 100% how we feel about them too. Thank you for taking the time to tell me, that made my morning! Love these! Made them with my 9 year old autistic grandson and his almost 5 year old sister. They had a blast and gobbled up several before they were completely cool. We will definitely be making these again! Thank you so much for sharing your gift of baking. Cooking with your people, I LOVE IT! Go grandma go! By far the best chocolate chip cookie recipe EVER!! I made them for a BBQ and they were a hit! I will definitely make extra next time and freeze the dough. When I want cookies I always use this recipe as it never disappoints and they stay nice and soft! Thank you for the review Karina! They are forever our favorite too. Come make them at my place?! I liked it.your explanation are helpfull. I love cookies. Can u plz tell us a butter stick how much in grams? Can I use just the amount of brown suger I felt it has alot of suger. So yummy! I used mini M&M’s instead of chocolate chips and they turned out great. Definitely recommend! Yes! One of my kid’s favorite substitutions for this recipe too! Thanks for sharing friend, I’m so happy you loved them as much as we do! I used a store-brand salted butter, nothing special and I whip it 8-10 minutes if I put it in hot. It’s a long time! It’ll still work even if you don’t beat it a ton, I think it just develops the flavor. Did you make them? What did you think? i dont have any parchment paper, do you think greasy a cookie sheet would be okay? Parchment, a baking mat, or a lightly greased sheet will all work, thanks for asking and happy cookie making! Is it salted or unsalted butter?? I’ve used both with great success, though unsalted is typical for baking goods, us what you have on hand!